This tapestry "Chateau Belleview III" shows a grand scene from the 17th century "Royal Residences". In this piece, we see a work based on the originals woven by the Gobelins Manufacture, created under the rule and guidance of King Louis XIV. Tapestries from the manufacture was used to decorate the palace of Versailles. Here we see the scene of a balcony with red drapes and musical instruments including a horn, and baskets of flowers. In the fields beyond are nobles on horses and the foliage and trees in the distance leads the eye to the castle in the distance. A decorative border and garlands of flowers complete the scene. 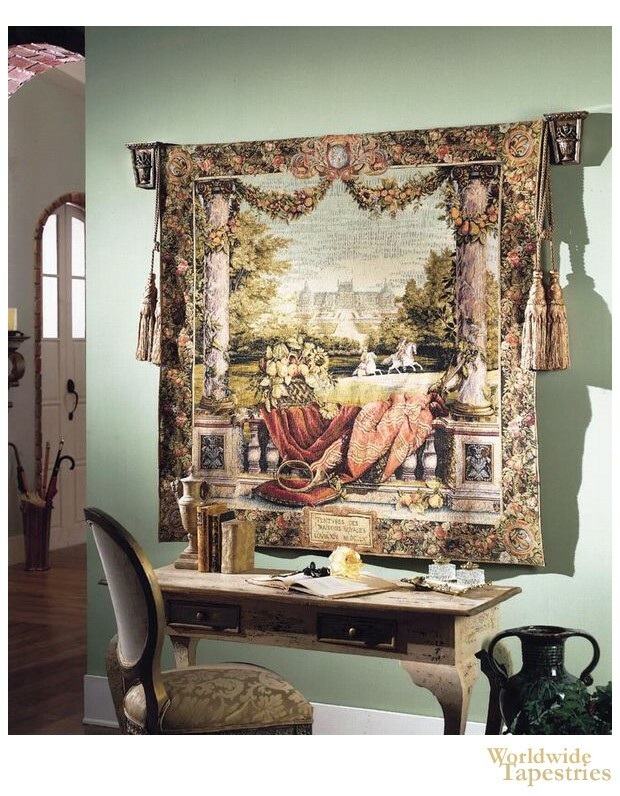 This Chateau Belleview III grand tapestry is backed with a lining and has a rod pocket for easy hanging. Note: tapestry rod, tassels and accessories, where pictured, are purchased separately. Dimensions: W 57" x H 58"